Before I can go into any details of the trip, I must first tell you that Brett and I are both geographically challenged when it comes to the size of Asia. We mistakenly assumed that our flight time from Beijing would be 4-5 hours, when in reality, it was 9 hours of air time plus an overnight stay in Kuala Lumpur, Malaysia. Needless to say that when we finally arrived, we wanted nothing more than a cold beverage (avec bourbon) by the pool! Our hotel, The Ayana Resort, is comprised of 78 freestanding, cliff-top villas. Each villa has its own infinity edge pool overlooking the Indian Ocean. Honestly, it is pretty ridiculous. I should now take the time to selfishly thank all those involved in causing the financial crisis, which allowed us to afford a vacation at this small piece of heaven on earth. Best to look at the bright side of things, right? Our villa was so secluded that at times we felt completely removed from all civilization. Although I suppose the blaring Bose speakers, the Michelin Star quality room service, and the personal butler were pretty clear reminders. Sarcasm intended. Those modern luxuries aside, the remoteness of our accommodations contributed greatly to our most favorite Balinese experience (or Balanean experience in Brett speak). It was our very first day. We were playing in the pool and my back was to the ocean. With a very odd look on his face, Brett announced that a rather decent size monkey was rapidly approaching us. As a monkey lover and one born in the year of the monkey, I was immediately filled with excitement. Could it be? Another monkey for my monkey pack? (The Hangover movie reference) . The truth is, the monkey was not trying to join my monkey pack. In fact, he just wanted our food. He initially went for a full bag of wasabi peas. We assumed, after he spit them out faster than a Nolan Ryan fastball in his prime, he was not a fan. Luckily for him (it was definitely a him) there was also a delicious bag of salt and vinegar potato chips nearby. 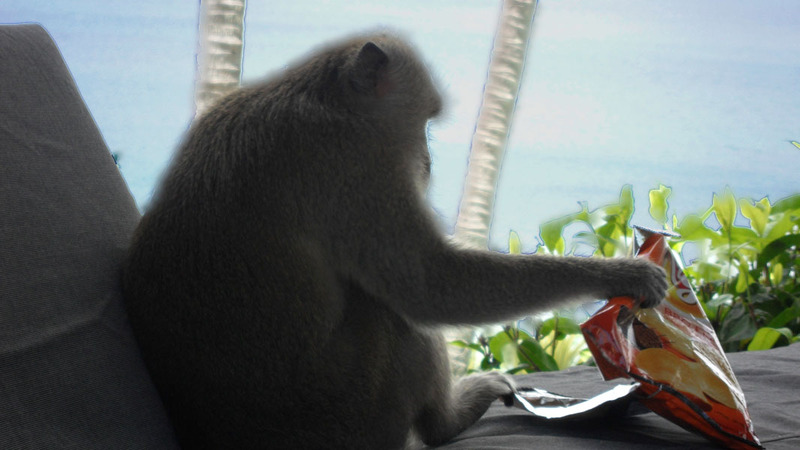 With a human like grip, he carried the bag to our cabana, reclined on the plush cushions, and proceeded to eat the entire bag…one chimp…I mean one chip at a time. 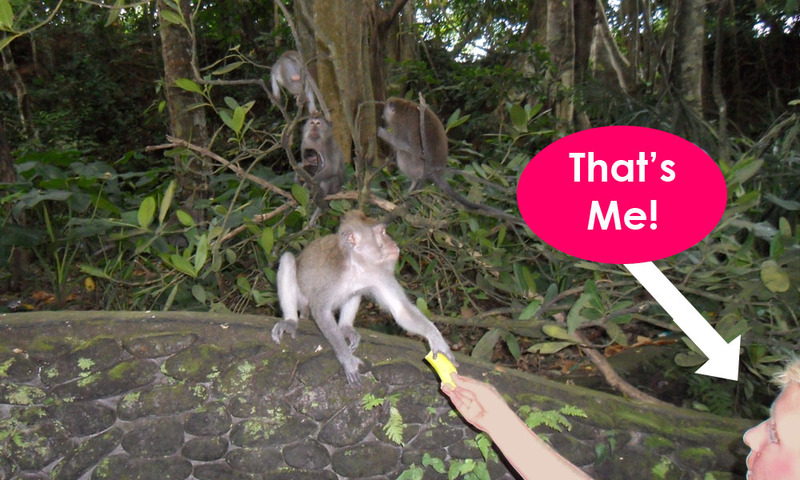 While the wild monkey visit was a highlight for me, Bali had so much more to offer. 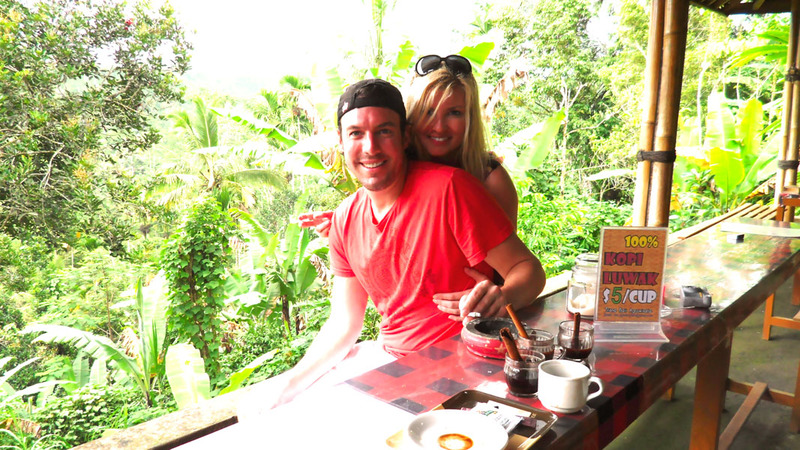 We visited amazing rice paddies, beautiful coffee plantations, and an entire wild monkey forest. There are so many extraordinary resorts on the island of Bali; however, I strongly recommend Ayana. The Spa on the Rocks is to die for, and the location on the island receives the most sunshine of any other spot. Life is short. Go to Bali. BTW: The monkey did visit us again. On the 2nd visit, he realized that we did not have any accessible food. So…he peed all over Brett’s flip-flops, and left. Good times. I love it! I want to join the monkey pack! Did you know there is actually a punctuation mark that signifies sarcasm? I love that! Btw- what is the mark for sarcasm? I know you are probably getting thousands of hits right now, but just wanted to say I like your blog! I’m going to send to my brother too, who is a world-traveler..he’ll love it! I subscribed! Wow – what an incredible experience. It sure sounds like my idea of heaven! This post has inspired me to visit Bali. I know that there is some degree of political unrest in the area, so I would be interested to know if Americans are welcome? Gorgeous post. Thanks! Excuse me, but how can you be living in Beijing and not have come to appreciate the vastness of Asia. How can you book a trip and not be curious enough to look at your itinerary? Sounds like you spend too much time in infinity pools–please try to be a better cultural ambassador. I hate that it read as if we boarded a plane with no idea of our travel time or the uniqueness of our destination. My comment was actually intended to show the vastness of Asia while poking fun at myself. Remember: I am the blonde in Beijing! 🙂 We actually spent a lot of time touring the island – the volcanoes, the local craftsmen and artists, the rice paddies, the coffee and tobacco plantations, etc. Bali is a wonderful cultural experience with friendly people, breathtaking landscapes, and beautiful handy crafts centered around rich religious traditions. I want to be a good cultural ambassador, but a little pool time never hurt anyone. It was a vacation after all. Very comical. I really enjoyed reading this. LOL this is great! I hate Wasabi Peas! Our monkey likes cigs, haven’t tried wasabi yet!! LOL. Awesome article. I hear you about the flight time. I lived in Japan for a while and everything looked so close on the map but it seemed like every flight was 10 hours no matter where I went! Thanks for the laugh–I wouldn’t want to make the monkeys mad. hahaha this is so funny! love it! It was really very good to read about your trip. How much did the whole trip cost ?? I am sending you an email…. Yep I love Bali too … went there many years ago now … from Sydney Australia it was 12 hours back then …coming from near the bottom of Australia I always assume any overseas flight will be an endurance feat … unless it’s New Zealand. What a fantastic post. You sure do have a way with words. I got the sarcasm, no worries. However, I would like to know what that punctuation mark is that someone mentioned. Seriously, this was a great read. Cheers! Great read, the monkey was cool. I wouldn’t like wasabi peas either I think. 😛 I’m subscribing! Haha. Cheeky little git! (The monkey, not you). What great pics!! Thanks for sharing them! As I said before–Look out Candace Bushnell!! !